In looking at activities to promote the adoption of iPads among faculty, it occurred to me that in order to help people appreciate the usefulness of the device, I need to do more than just recommend some apps that make my life easier. I also need to describe the workflow surrounding the apps. A while back, I created a post to demonstrate how I Use iAnnotate to take note on my iPad (complete with cheezy video). Of course, this little demo is useful if you already have means for getting files to and from your iPad, and if you already have a strategy for managing those files on your computer. But, for those that are new to the iPad, my post leaves out too many details, that it is of limited use to those that just bought their iPads and are trying to figure out how to use them. With this gap in mind, I’ve created an example of a work-flow that explains the complete process of reading and annotating my PDF journal articles. Search for article. The process for finding article is beyond the scope of this point, but might make a nice future one! In short, I typically use Google Scholar to find articles. I have configured Google Scholar to use my university’s library, so retrieving articles is usually quick and easy. Download PDF, Save in Dropbox. I use Dropbox as the primary mechanism for transferring files between my computer and my iPad. Dropbox is free and a lot of applications integrate with it directly, making is a practical way to share files across devices. The software must be installed on both your computer and your iPad. If you don’t already have a Dropbox account and are planning to sign up, I’d appreciate it if you used my referral link, as it gives me more “free” storage space. Open in iAnnotate. The first time you use iAnnotate with Dropbox, you need to setup the connection between Dropbox and iAnnotate. Fortunately, iAnnotate has added a connection type of Dropbox, which means all you need to do is add your Dropbox account information and it just works. In iAnnotate, I open the Library then go to Connectivity. I select Dropbox, browse for the document and select it. Upon selection, the document is downloaded to my iPad. I then go back to the Library tab and select the document again, which opens it in the reading pane. Read and Annotate. For details on how I do this see Use iAnnotate to take note on my iPad (complete with cheezy video). Email Annotations. This is another one of those buried iAnnotate features. I click the tool box and under Document there is an option to E-mail Annotation Summary. This allows me to email all the text that I highlighted in the document, so that I don’t need to type in any quotations, and it allows me to store the key quotes in notes. Sync back to Dropbox. This is literally a click of a button. I click the Sync button and select Sync with Server. Copy from Dropbox to Mendeley. I literally drag-and-drop the file from my Dropbox folder to the Mendeley desktop application. Once that is done, I double check that Mendeley has added the citation information correct. Here is a video (without sound) of how to look up articles in details by DOI. Add emailed Annotations into Mendeley. On the notes tab for the article, I copy in the Annotations that I emailed myself in step 5. Delete file from Dropbox. I have setup Mendeley to organize and store my files. Mendeley stores them locally on my machine, as well as a copy on the Mendeley server, so I don’t keep a copy on Dropbox anymore. I may choose to move my local Mendeley reference directory back to Dropbox at some point in time just to have the extra backup. Either way, I still need to delete the copy that came from my iPad, so that I don’t end up with multiple copies on my computer. For me, multiple copies means I can’t figure out which one is my master version. Delete file from iPad. Finally, I go into the iAnnotate library and delete the file from iAnnotate. 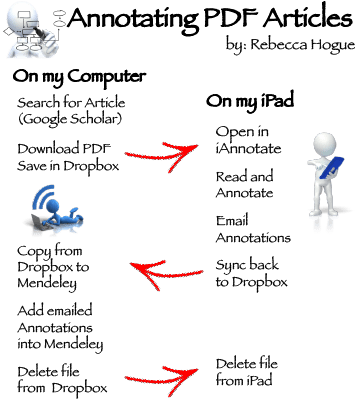 If I want it again, I can always get it from the iPad Mendeley app, or I can copy it back into Dropbox and repeat this process. That’s it! That being said, the process is a little more convoluted that I’d like it to be. It would save me a fair bit of file management if Mendeley would integrate with iAnnotate. Mendeley does include some annotation capability on the Mac, but it doesn’t transfer to the iPad and the Mendeley PDF viewer on the iPad isn’t nearly as good as iAnnotate. Was this useful? Do you want me to do more Workflows? Next → Next post: Do I “do” Social Media?